IPhD, MS, MPH. Division of Tuberculosis Elimination, Centers for Disease Control and Prevention, Atlanta, Georgia, USA. BACKGROUND: Standardised tuberculosis (TB) treatment through directly observed therapy (DOT) is available in South Africa, but the level of adherence to standardised TB treatment and its impact on treatment outcomes is unknown. OBJECTIVES: To describe adherence to standardised TB treatment and provision of DOT, and analyse its impact on treatment outcome. METHODS: We utilised data collected for an evaluation of the South African national TB surveillance system. A treatment regimen was considered appropriate if based on national treatment guidelines. Multivariate log-binomial regression was used to evaluate the association between treatment regimens, including DOT provision, and treatment outcome. RESULTS: Of 1 339 TB cases in the parent evaluation, 598 (44.7%) were excluded from analysis owing to missing outcome or treatment information. The majority (697, 94.1%) of the remaining 741 patients received an appropriate TB regimen. Almost all patients (717, 96.8%) received DOT, 443 (59.8%) throughout the treatment course and 274 (37.0%) during the intensive (256, 34.6%) or continuation (18, 2.4%) phase. Independent predictors of poor outcome were partial DOT (adjusted risk ratio (aRR) 3.1, 95% confidence interval (CI) 2.2 - 4.3) and previous treatment default (aRR 2.3, 95% CI 1.1 - 4.8). CONCLUSION: Patients who received incomplete DOT or had a history of defaulting from TB treatment had an increased risk of poor outcomes. According to the World Health Organization (WHO), South Africa (SA) was one of five countries with the highest TB incidence in 2011, estimated at 500 000 new TB cases and approximately 25 000 deaths. In 2009 the South African National Tuberculosis Programme (NTP) released new national tuberculosis management guidelines for healthcare personnel and managers. The guidelines include treatment strategies suggested by the WHO and recommend that all patients receive directly observed therapy (DOT) for the entire treatment course. However, despite NTP efforts to improve access to treatment and treatment adherence among TB patients, the proportion with successful treatment outcomes remains low (79% v. target of 86% cured or completed treatment) and mortality rates remain high (49/100 000). Patients in whom treatment fails or who do not complete treatment are at risk for acquisition of drug-resistant TB, additional morbidity, and mortality. A patient's ability to adhere to TB treatment is a complex, dynamic phenomenon with a wide range of factors impacting on treatment-taking behaviour. Non-adherence to assigned treatment has been cited as the major barrier to TB control worldwide. [3-8] Although DOT has been well documented to improve patient adherence to TB treatment and optimise treatment outcomes,[4-6] studies have reported that DOT coverage remains low in many parts of the world, including SA. [3-6] A study conducted in the North West Province of SA found that the proportion of TB patients receiving DOT was as low as 56.8%, with coverage lowest among TB retreatment patients,'51 while another in KwaZulu-Natal reported that only 43 of 70 priority facilities (61%) had a DOT programme. Furthermore, although countries have implemented the WHO-recommended directly observed, short-course (DOTS) strategy that includes DOT along with four other components, individual healthcare workers (HCWs) may not be aware of or fully informed about the strategy, may not be willing to implement it, or may not have the resources to implement it. Studies have reported that not all HCWs have been exposed to the national TB treatment guidelines, and many are not prescribing recommended regimens. [8-10] A 2012 systematic review that included 31 studies from 14 countries cited wide variation in HCW knowledge of treatment regimens (8 - 100%) and treatment duration (5 - 99%). According to another recent review, inappropriate treatment regimens were often prescribed to patients (in 67% of 37 studies included in the review), with the proportion of patients on inappropriate treatment regimens ranging between 0.4% and 100%. In SA, while several studies evaluating DOT have been conducted,[5-6] the effect on treatment outcomes of failing to adhere to guidelines for standard treatment regimens and DOT has not been investigated previously. Knowledge of the impact of non-adherence to standard regimens and DOT on treatment outcomes will allow programmes and clinicians to recognise practices essential to treat and manage patients with TB effectively. We aimed to describe treatment management practices in three SA provinces, including assignment of treatment regimen and DOT coverage for TB patients; evaluate treatment regimen practices and DOT coverage in the context of national TB treatment guidelines; and assess the impact of failing to adhere to standard treatment regimens and DOT on TB treatment outcomes. We conducted a secondary analysis of data collected as part of a parent project aimed at evaluating the TB surveillance and electronic tuberculosis registry (ETR) in SA. The parent project included 1 339 patients diagnosed with TB in the first quarter of 2009 in Gauteng, KwaZulu-Natal and Mpumalanga provinces. Information on key TB variables was abstracted onto standardised forms from multiple data sources, including the patient treatment card, the paper TB register at the health facility, and the ETR at the sub-district (initial), district, provincial and national levels. Owing to missing information in the ETR at these district, provincial and national levels, the current analysis was restricted to the three initial data sources: patient treatment card, TB register and initial ETR. We used the following decision rules to resolve discrepant information from the multiple data sources: (i) if there was information in all 3 data sources, we accepted the variable value reflected in 2 of 3 sources; (ii) if 3 or 2 data sources had a value available but all had different values, the value in the TB register was used; and (iii) if only 1 data source had information available, we took the value from this source. Our analysis included all TB patients in the parent project for whom information was available on TB treatment regimen, DOT coverage, and treatment outcome in at least one data source. All cases with missing information on TB treatment regimen, DOT coverage or treatment outcome and those who moved or transferred out during the current treatment episode were excluded. Treatment regimens were categorised as appropriate or inappropriate based on national guidelines. The guidelines include WHO-recommended treatment strategies for new patients (regimen 1), retreatment patients (regimen 2) and children (regimen 3). Adults and children aged 8 years and older with no history of a previous TB episode who were prescribed standard therapy (regimen 1) were considered to be on appropriate therapy; all other regimens for these patients were classified as inappropriate. Regimen 2 was considered appropriate for retreatment patients, and regimen 3 was considered to be appropriate for children younger than 8 years of age; other regimens prescribed for these patient groups were considered inappropriate. DOT adherence was categorised as full for those who received DOT during the entire course of TB treatment (100% of doses through DOT), partial for patients receiving DOT during either the intensive or the continuation phase, and no DOT for patients who were not provided any DOT during treatment. Death, treatment failure and default were considered poor TB treatment outcomes; cure and treatment completion were considered successful outcomes. Risk ratios (RRs) and 95% confidence intervals (CIs) were used to measure the effect of adherence to standard treatment regimens and DOT on treatment outcomes. Univariate associations were further examined to identify potential confounders and effect modifiers. A multivariate log-binomial regression model was developed to identify independent predictors of poor treatment outcome among TB patients. Variables with an established biological plausibility based on previous research or that were significant based on a cut-off of p<0.05 were retained in the final model. Since data collection was a part of routine TB control efforts, individual patient consent or parental assent was not required. All data were safeguarded to protect patient confidentiality and no individual patient identifiers were retained in the study database. Participation of the US Centers for Disease Control and Prevention (CDC) and the South African National Department of Health in this project did not meet the definition of engagement in research on human subjects because the investigators did not interact with study subjects or have access to patient identifiable data, so separate institutional review board approval was not required. A formal written waiver for the need for ethics approval was issued by the CDC/DTBE associate director of science. 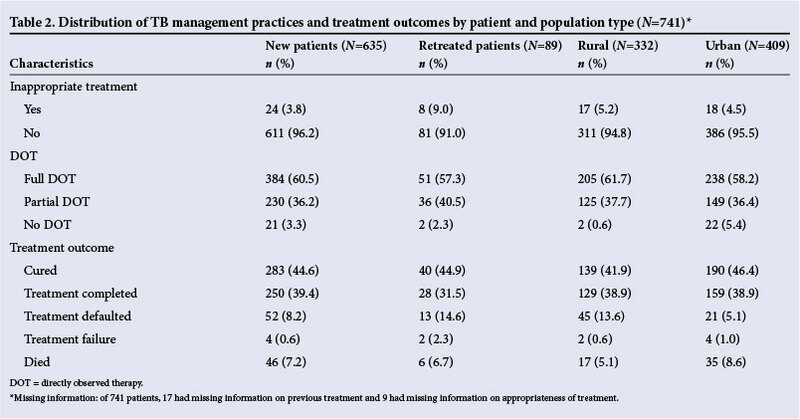 Of 1 339 patients in the parent project, 598 (44.7%) were excluded owing to missing information on final treatment outcome (n=130), DOT coverage (n=213) or both (n=252), or treatment regimen (n=3) (Fig. 1). Compared with the patients with complete data (analytic cohort, n=741), patients with a missing outcome had a different distribution of DOT categories: a lower proportion of full DOT but a higher proportion of partial DOT (Table 1). Additionally, the 213 patients with missing DOT data had worse outcomes than the 741 patients in the analytic cohort. The analytic cohort included cases who were younger on average than excluded cases (mean age 33 v. 35 years among excluded cases; p=0.03) and were less likely to be HIV-infected (72.6% v. 79.1%, p=0.02) and to live in rural settings (55.2% v. 75.3%; p<0.0001) (Table 1). There was no significant difference in gender distribution (approximately half were male: 53.9%; p=0.9) or site of disease (82.8% pulmonary v. 79.4% pulmonary disease; p=0.1). Most patients in the analytic cohort (635, 87.7%) were new cases, although 89 (12.3%) were previously treated, including 55 (7.6%) relapses and 22 (3.0%) retreated after failure or default. Seventeen patients had missing information on previous treatment. Approximately three-quarters of patients (571, 77.0%) received treatment regimen 1, 88 (11.9%) received regimen 2, and 79 (10.7%) received regimen 3. Thirty-five patients (4.8%), including 8 children (22.9%), were considered to have received an inappropriate regimen for TB treatment according to national guidelines. We were not able to assess appropriateness of treatment among 9 adult patients owing to missing information on patient category. Almost all patients (96.8%) received DOT during treatment: 443 (59.8%) received DOT during the entire treatment course, and 274 (37.0%) received DOT during either the intensive or continuation phase, including 256 (34.6%) receiving DOT during the intensive phase only (Table 1). 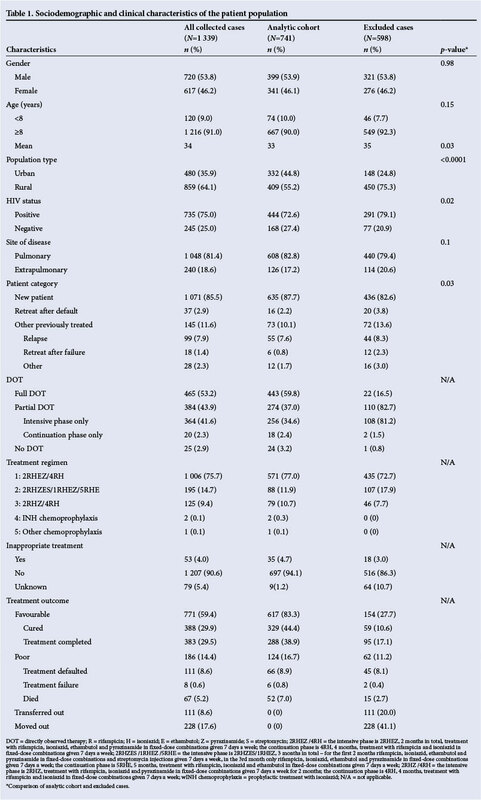 Of the 635 new cases, 24 (3.8%) received inappropriate treatment regimens; 384 (60.5%) received DOT during the entire course of TB treatment, 230 (36.2%) received partial DOT during the intensive or continuation phase, and 21 (3.3%) did not receive DOT during treatment (Table 2). 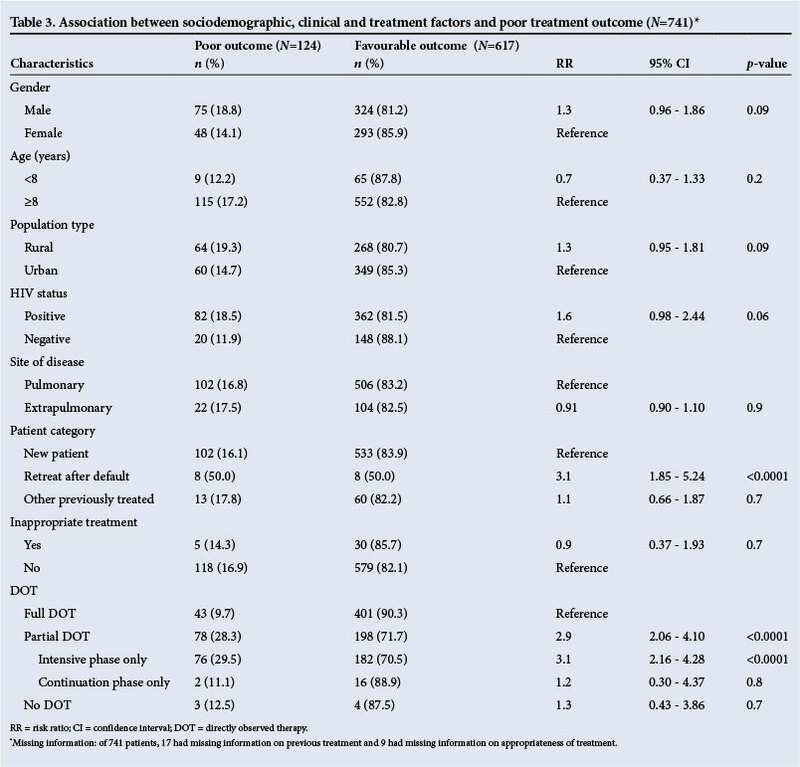 Among 89 retreated patients, 8 (9.0%) received inappropriate treatment regimens; 51 (57.3%) received DOT during the entire course of TB treatment, 36 (40.5%) received partial DOT, and 2 (2.3%) did not receive DOT during treatment (Table 2). Among the 741 patients, 124 (16.7%) had a poor treatment outcome, including 66 (8.9%) who defaulted, 6 (0.8%) in whom treatment failed, and 52 (7.0%) who died. Paradoxically, the proportion of patients with a poor outcome was lower among patients who received inappropriate treatment (5/35, 14.3%) compared with those on appropriate treatment (118/697, 17.0%). 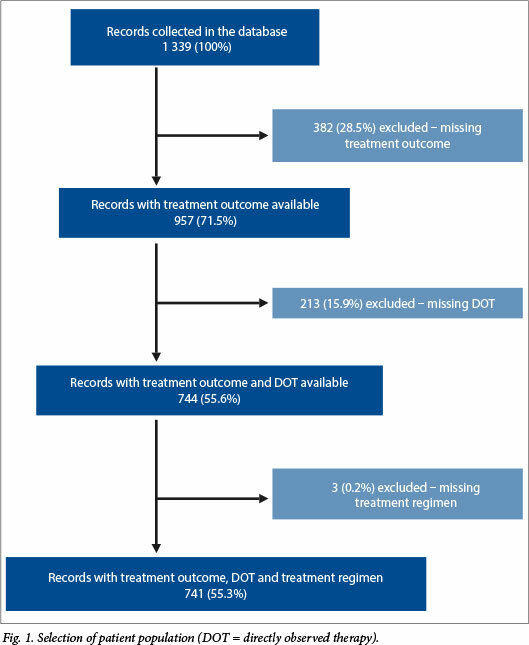 Patients receiving partial DOT during treatment and those who did not receive DOT had higher proportions of poor outcomes (78/256, 28.3% and 3/7, 12.5%, respectively) than patients who received DOT during the entire course of the treatment (43/444, 9.7%) (Table 3). In univariate analysis, predictors of poor treatment outcome were receiving partial DOT (RR 2.9, 95% CI 2.1 - 4.1; p<0.001) and having defaulted during a previous TB treatment episode (RR 3.1, 95% CI 1.9 - 5.2; p=0.001) (Table 3). Patients who received DOT during the intensive phase had an increased risk of a poor outcome compared with patients who received DOT during the entire course of treatment (RR 3.1, 95% CI 2.2 - 4.3; p<0.001). There was no significant association between inappropriate regimen and treatment outcome. Stratified analysis did not reveal any effect modification of these associations by sociodemographic, clinical or treatment practice indicators. In a multivariate regression model, having received DOT during only the intensive phase of treatment (adjusted risk ratio (aRR) 3.1, 95% CI 2.2 - 4.3) and a history of previous TB treatment default (aRR 2.3, 95% CI 1.1 - 4.8) were independently associated with a poor outcome after adjusting for age, gender, HIV status and population type (Table 4). This evaluation provides a detailed description of TB treatment management practices in three provinces of SA, including assignment of treatment regimen and DOT coverage, and their impact on treatment outcomes. Our findings demonstrate that incomplete DOT, specifically receiving DOT during the intensive phase only, is independently associated with poor treatment outcome. Our results are consistent with previous research and programme evaluation findings on TB management practices citing standardised DOT coverage as essential to TB control. [3-6] A study evaluating DOT in KwaZulu-Natal demonstrated that the facilities with high DOT coverage had significantly better cure rates than those with low DOT coverage (p=0.045). A Nigerian study reported that implementing DOT in hospitals led to a significant increase in the number of patients completing treatment and a significant reduction in mortality among TB patients. DOT helps to ensure that patients adhere to and complete TB treatment regimens. A study in Zambia established that 29.8% of TB patients stopped taking their TB treatment once they started feeling better. Similarly, researchers in Uganda reported that the continuation phase of TB treatment was significantly associated with non-adherence to TB treatment (odds ratio 6.2; p<0.001). These previous studies support our finding that patients who do not receive DOT during the continuation phase have a threefold increased risk for poor treatment outcome compared with patients who receive DOT throughout the course of treatment. The majority of patients received appropriate treatment regimens, with 96.2% of new and 91.0% of retreatment patients receiving the recommended therapy according to the NTP guidelines. Inappropriate treatment regimens were not, however, associated with poor treatment outcomes. This may be because the regimens classified as inappropriate include some that were 'stronger' or 'longer' than the standard recommended regimens. We did identify that patients with a history of treatment default are at an increased risk of poor outcome compared with new patients. The increased risk of poor outcome associated with partial DOT and previous default illustrates the importance of adherence to TB treatment in achieving a successful outcome. This study has several limitations. Owing to missing information on TB treatment regimen, DOT coverage and treatment outcome, 598 cases (44.7%) were excluded from analysis. Although the gender distribution was similar between analysed and excluded cases, parameters such as age, population type, HIV status, patient category, DOT use and treatment outcomes were different. However, the purpose of this analysis was to evaluate the status of the existing TB control programme in these locations, not to make inferences regarding the larger population of all TB patients. Representative sampling is therefore less of an issue, and the results reported reflect the actual situation in this sample. Further, the data were obtained retrospectively from medical and surveillance documents recorded as part of programmatic surveillance, not as part of a research study. It is therefore possible that the recording of information may not have been standardised across different health facilities and providers. Also, owing to the presence of multiple sources of information, decision rules were established to resolve discrepant values. Unfortunately, there was no mechanism to determine which data source most accurately reflects patient information. While most studies rely on a single source document that may not accurately reflect the true value, this analysis was able to maximise the completeness and reliability of information by utilising several data sources. Because we were not able to assess inappropriate treatment in more detail from a clinical perspective owing to lack of patient information on severity of disease and smear status of paediatric patients, this evaluation may have overestimated the actual number of patients receiving inappropriate treatment. However, we believe this information would have impacted on our results only minimally because few clinical indications would have led to reclassification of regimen appropriateness, as regimen standards are based on general patient groups (new/retreatment; adult/child). Finally, there is a possibility of confounding by other factors that were not available in the current dataset. However, we examined all available socio-demographic, clinical and treatment factors as potential confounders and effect modifiers in the current analyses. In conclusion, our evaluation demonstrated a high level of adherence to NTP treatment and management guidelines in the selected provinces of SA. Receiving DOT during only the intensive phase of treatment and a history of previous TB treatment default were independently associated with poor treatment outcome. The results suggest that health facilities in these provinces may need additional training and resources to ensure that all patients receive DOT throughout the course of treatment. These results underscore the importance of DOT as a critical element in overall TB programme success. Disclaimer. The findings and conclusions in this report are those of the authors and do not necessarily represent the official position of the Centers for Disease Control and Prevention, the University of South Florida and the South African National Department of Health. Author contributions. JVE had full access to all the data in the study and took responsibility for the integrity of the data and the accuracy of the data analysis. She substantially contributed to conception and design, acquisition of data, statistical analysis and interpretation of data, drafting of the manuscript, and critical revision of the manuscript for important intellectual content. LJP substantially contributed to conception and design, acquisition of data, statistical analysis and interpretation of data, drafting and critical revision of the manuscript for important intellectual content, provided administrative and technical support and supervision, and revised and approved the final version to be published. LEB substantially contributed to conception and design, acquisition of data, statistical analysis and interpretation of data, drafting and critical revision of the manuscript for important intellectual content, and revised and approved the final version to be published. HGS substantially contributed to statistical analysis and interpretation of data, drafting and critical revision of the manuscript for important intellectual content, and revised and approved the final version to be published. SD substantially contributed to conception, design, and acquisition of data, provided administrative, technical and material support, and revised and approved the final version to be published. LDM substantially contributed to conception, design, and acquisition of data, provided administrative, technical and material support, and revised and approved the final version to be published.